Alastair Gray teaches at, and heads up, course development and e-Learning at AHE NYC | World. 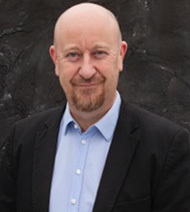 He holds various consulting roles: academic (Endeavour College, Australia) educational (Portland Centre of Integrative Medicine, UK); communications (HRI, UK); and management (Director Operations College of Health and Homeopathy NZ), as well as consulting to organizations on homeopathic provings and e-learning. Prior to this, in Australia, he headed up the homeopathy department at Endeavour, and was the National Academic e-Learning Manager. He has lectured under- and post-graduate CM, homeopathy, and naturopathy for 18 years, including philosophy, case taking and management, ethics, business practices, and scope of practice. As well as being a regular seminar and conference presenter worldwide, Alastair is the author of 22 books and numerous articles on primary research in natural medicine. He is passionate about e-Learning and educational technology in his academic and teaching work. Clinical practice (25 years) remains a significant focus. He is enrolled in a PhD program at University Technology Sydney, exploring the intersection of Education, CM, and learning technologies.